(Loot) Paytm – Get 100% Cashback on Ready Player One (Special Screening). 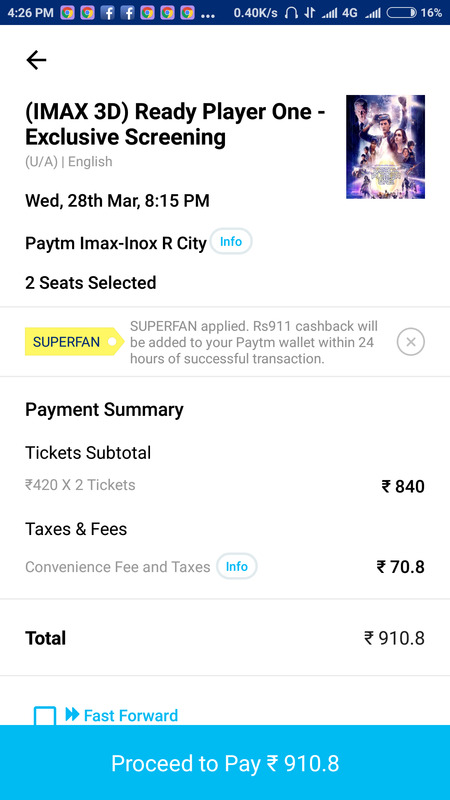 Paytm has come up with Booking of Ready Player One Movie Tickets offer where you will get the 100% Cashback upto a Maximum of Rs 1000 on purchase of 2 Movie Tickets and No Minimum Purchase required. Maximum cashback is Rs 1000 per user. So Hurry up and book your Ready Player One Movie Tickets now !! How to Get 100% Cashback on Booking Ready Player One Movie Tickets ? Note:- Please Selected Special screen cinema only. Valid for big cites..
7) Once your Coupon code get Applied sucessfully, then Pay the amount using any of the Payment mode OR Paytm Payments Bank to get additional Rs 40 Cashback. *Use Promocode ‘Superfan’ to get 100% Cashback on total ticket price, upto Rs. 150. *The offer is applicable only on Ready Player One Movie. *The promocode is valid on a minimum booking of two tickets. *Valid only in Selected Big Cities and Special Screening only. Hey your link is not working!! After coupon applying Its showing cashback will be processed after show,what’s meaning?how much wil i get cashback?? You will get cashback once your show time get over ! !